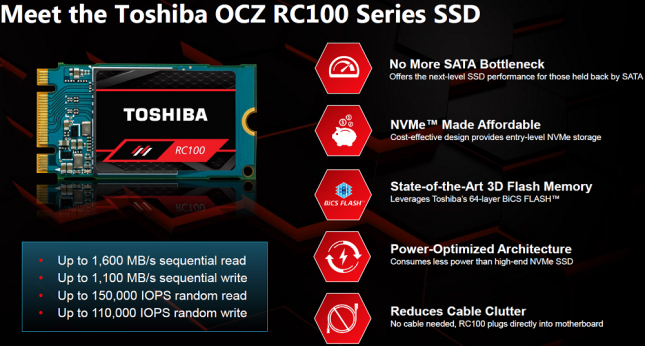 We first learned about the Toshiba RC100 Series SSD at CES 2018 and were intrigued by the by what Toshiba was showing off. 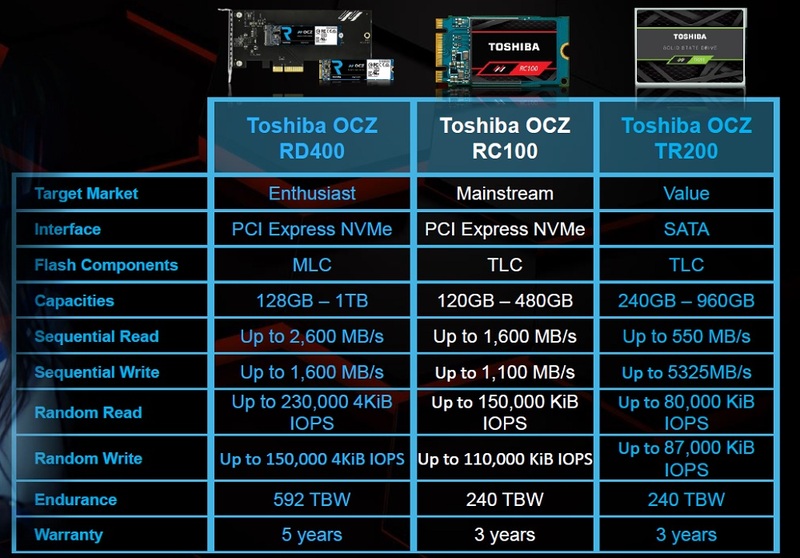 The RC100 series are all M.2 PCIe Gen 3×2 NVMe drives that use the tiny 2242 form factor rather than the much more common 2280 form factor. Toshiba was able to release this drive on such a small PCB as it uses single-core design where the Toshiba DRAM-less controller and 64-Layer TLC NAND Flash (BiCS3) are all on the same package. Most desktop and laptop users will likely care less about the smaller 2242 form factor being used, but this is a big deal for laptop users that have an open WWAN/LTE M.2 (miniPCIe) slot and want a secondary drive for more storage space. This is a pretty small niche market though and of the half dozen notebooks that we have in the labs none have an open WWAN slot, so we’ll be sticking to our desktop test platform to review the RC100. The Toshiba RC100 series is available in 120GB, 240GB and 480GB capacities for $59.99, $79.99 and $154.00, respectively. Performance for the series varies depending on the capacity of the model, but you are looking at sequential Read/Write speeds of up to 1600/1100 MB/s and Random 4K Read/Write speeds of up to 150,000/110,000 IOPs. When it comes to endurance you are looking at an endurance rating of 60 TBW per every 120GB of storage space. If you do some math with the series 3-year warranty that gives you a peak daily usage of 55GB written per day on the 120GB drive, 110GB/day on the 240GB drive and 219GB/day on the largest 480GB/day. This isn’t the highest rating around, but remember this is targeted to mainstream users and most folks aren’t writing nearly this much data to their drive per day. 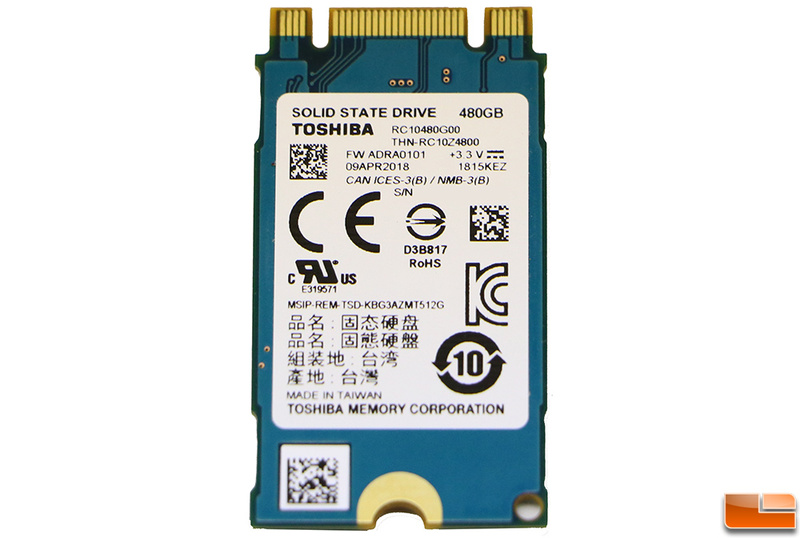 If you need more performance or a higher endurance rating there is also the Toshiba RD400 series of drives that we reviewed back in 2016. 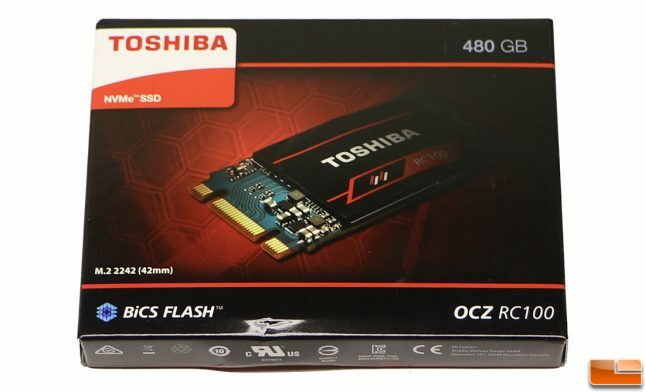 The model that we’ll be benchmarking and trying out for you today is the Toshiba OCZ RC100 480GB NVMe SSD that is sold under part number THN-RC100Z4800G8 for $154.99 shipped or roughly $0.32 per GB. The Toshiba OCZ RC100 retail packaging looks sharp, but inside you’ll find just the drive and a quick start guide. The Toshiba OCZ RC100 series uses the M.2 2242 form factor, which is just 42mm in length. It makes drives that use the M.2 2280 (80mm long) form factor look massive! On the back of the this single-sided M.2 2242 drive we find nothing as one might expect when it comes to components, but there is the warranty label that has the drives model number, firmware version, date of manufacture, serial number and other information. 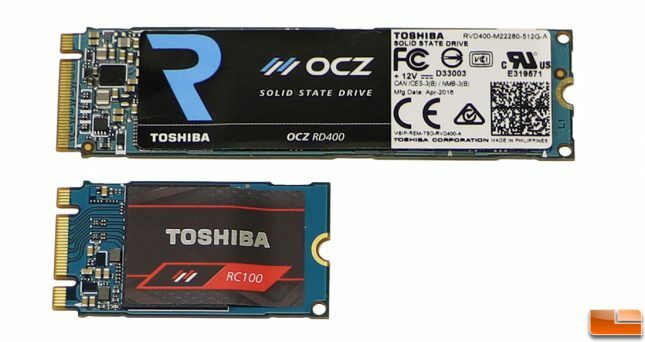 The RC100 series supports the latest build of the OCZ SSD Utility that can be downloaded for free online. This ‘SSD Toolbox’ allows you to monitor the drive, check for firmware updates, benchmark the drive, perform a secure erase, and much more. It also shows how much host memory buffer (HBM) is being used by the OS on the DRAM-less drive. It looks like 10-38 MB of system DRAM will be allocated for the SSD, which isn’t too bad. 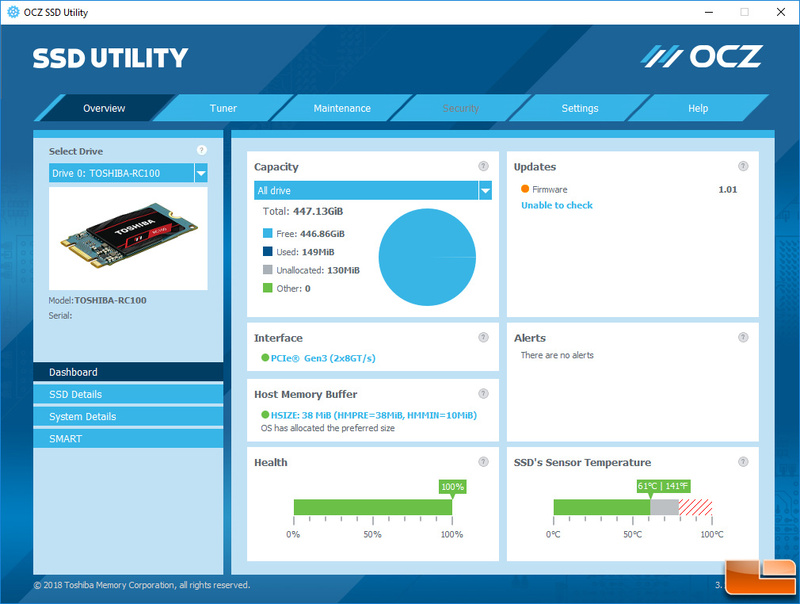 Let’s take a look at the test platform and then see how this drive performs in the benchmarks.